Allison Kavanagh is moving into a beautiful log house in the mountains; a home that once belonged to her great aunt. The house is wonderful; the reason Allison is moving there is not. After years of struggling through a difficult marriage Allison gave her husband an ultimatum. She was certain she’d heard from God and He would use her tough love stand to heal her marriage. Apparently she heard wrong; the divorce is now final and it’s time for Allison to start a new life alone. Aunt Emma had been a strong, independent woman who didn’t need a man to make a success of her life. Maybe living in her old home would help Allison learn to be more like her feisty relative. But when Allison finds Emma’s stash of old photos and diaries in the attic, she learns there was more to Emma’s story than she ever suspected . . . and the two of them were more alike than she thought. 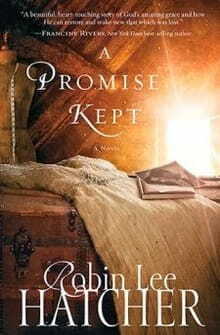 Allison and Emma’s journeys are woven together throughout A Promise Kept. Hatcher cleverly keeps the stories going at slightly different speeds; a complete parallel would have been much too predictable. Each is so engaging that even while caught up in Allison’s story part of my mind was wondering about Emma and vice versa. Either story would have been nice enough on its own and completely in line with what we’ve come to expect from typical Christian fiction. Hatcher is better than that. By combining the stories of two intriguing women into one, she’s given us a novel that is significantly better than nice. Allison’s memories show us the kind of woman Emma became but that’s a far cry from where she started. Meanwhile Allison’s ending is a mystery: Will she meet a nice man at the church in town and go on to find happiness in a new relationship? Or does God have something else in mind? Both women have to learn to trust God with their futures to grow into the women He created them to be. It’s not easy; God answers prayers in His own time and in His own way. How do you believe when it looks like God isn’t keeping his promise? These questions and more will keep readers turning pages until the final, satisfying end. Along the way there are a number of valuable life lessons (I wanted to take notes—how often does that happen in a novel?) all imparted through the story in an organic, non-sappy way. As Allison takes faltering steps toward a post-divorce recovery readers—divorced or not—will benefit from the reminder that God hates divorce, not the divorced. Eventually Allison and Emma will have to see themselves and their circumstances as they are, not as they wish they were. That’s an interesting perspective for a work of fiction and a powerful message. It’s just one of many features that elevates A Promise Kept far above the usual sweet little Christian story. Read it—you’ll be glad you did.